The Boat for Summer Sales Event is going on now. Get a $1,000 gift card and $200 in gear—FREE!—with your purchase of a new 2019 or prior model year FISHIN’ BARGE® 24 DLX. Hurry! This offer is only available for a limited time. See dealer for details. 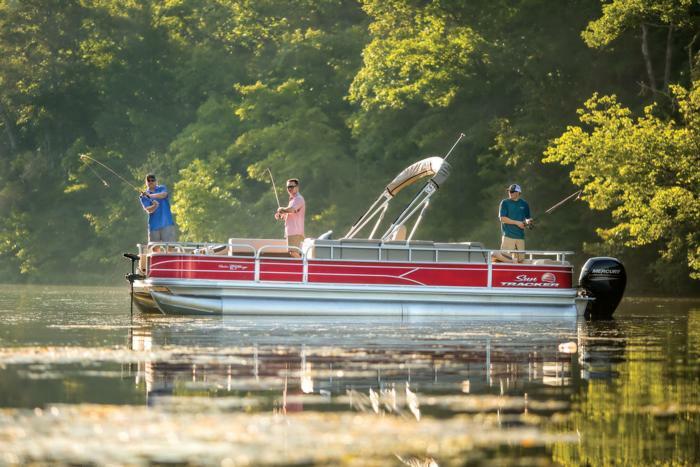 The extremely spacious FISHIN’ BARGE® 24 DLX uses its more than 26’ length to provide your crew of 12 everything they need to fish away the day in comfort. Need fishing features? 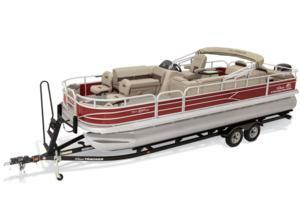 Fore and aft casting decks offer a total of four fishing chairs, multiple rod storage options and two aerated livewells. Need storage space? Multiple Stow More seat-back compartments, under-seat and under-console compartments and more give you space for all your gear. Need comfort? Plush seating and a QuickLift™ Bimini are ready. Need anything else? Just a crew to fill the seats and enjoy the water.